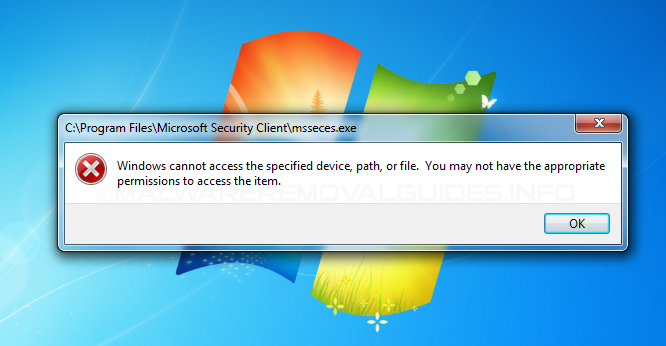 Microsoft Security Essentials - Windows cannot access the specified device, path, or file. Home » Rootkits » Microsoft Security Essentials – Windows cannot access the specified device, path, or file. Microsoft Security Essentials – Windows cannot access the specified device, path, or file. When you try to open Microsoft Security Essentials and you got the message “Windows cannot access the specified device, path, or file. You may not have the appropriate permissions to access the item.” then your computer is probably infected with the ZeroAccess rootkit. The new variants of this rootkit will alters the junction points for Microsoft Security Essentials and Windows Defender. Causing either program not to be able to be accessed, reinstalled or uninstalled. If you are able to force either Windows Defender or Microsoft Security Essentials folders and file removal Winows no longer boots normally, so don’t try to remove Windows Defender or Microsoft Security Essentials in this case. The latest bèta release of HitmanPro will now detects and removes these modified Reparse Points so that Microsoft Security Essentials or Windows Defender will function again, for removal of this malware we advise to follow the below instructions. Please download the latest official version of Kaspersky TDSSKiller to your desktop from one of the links below. If you can’t start Kaspersky TDSSKiller, you first need to rename it so that you can get it to run. Rename the executable from TDSSKiller.exe to iexplore.exe or svchost.exe, and then double-click on it to launch. Kaspersky TDSSKiller will now start and display the welcome screen and we will need to click on Change Parameters option. Click the Start Scan button to begin the scan and wait for it to finish. Warning! Do not use the computer during the scan! If no threats are found at this point, just click the Report selection on the top right of the form to generate a log. A log file report will pop which you can just close since the report file is already saved. If any infection or suspected items are found, you will see a window similar to below. If you have files that are shown to fail signature check do not take any action on these. Make sure you select Skip. We will tell you what to do with these later. These may not be issues at all. If ‘Suspicious objects’ are detected, the default action will be Skip. Leave the default set to Skip and click on Continue. If Malicious objects are detected, they will show in the Scan results. TDSSKiller automatically selects an action (Cure or Delete) for malicious objects. Make sure that Cure is selected. Important! -> If Cure is not available, please choose Skip instead. Do not choose Delete unless instructed to do so. Just for Reference purposes, if you were to quarantine any detected objects, Quarantined files will not be removed! They are moved to a quarantine folder. After clicking Next, TDSSKiller applies selected actions and outputs the result. A reboot might require after disinfection, please reboot immediately if it states that one is needed. 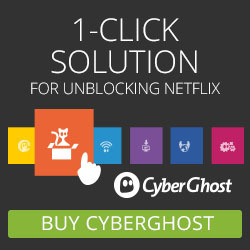 Download Roguekiller from one of the links below to your dekstop. 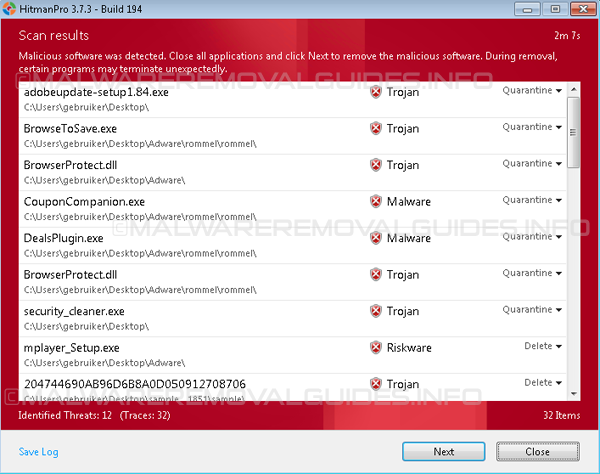 Double click on RogueKiller.exe to start this malware removal utility it will start automatically the prescan, this should take only a few seconds to complete. After the prescan is finished click on the Start button to perform a full system scan. If RogueKiller detects malicious Registry entries, you can delete them by clicking the Registry tab and clicking the Delete button. Please check each registry entry before deleting it. 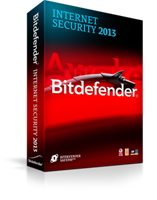 Choose a good internet security suite, Bitdefender’s Internet security 2013 is an excellent, user-friendly security suite, and with the autopilot technology there are no popups, no alerts or other messages because in this mode it will resolve almost every security issue on its own without the intervention of the user. Bitdefender Internet Security 2013 builds on #1 ranked antivirus technology to provide secure e-banking and e-shopping, online safety for kids, privacy protection on social networks and more! #1 ranking based on reviews from AV Test, AV Comparatives,CNET Downloads, PC Welt, Expert Reviews and many more. Bitdefender 2013 has been officially named “Product Of The Year”, “Best Antivirus For 2013” and “Best Repair of 2012” by the famous PC MAG magazine, and by two major reviewing institutions to date, AV-Test and AV-Comparatives. These achievements crown a year of accolades and awards, including distinctions from CNET, Laptop, Magazine, PC PRO, Expert Reviews, WebUser, PC Achat and Micro Hebdo.